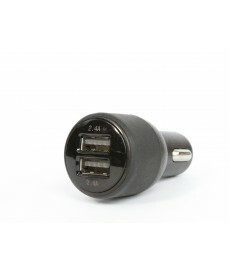 Although many cars now come with a USB port built in, many people don't realize that port is only putting out 1 amp of power. Just enough to maintain the battery and if not in use slowly charge the device connected. We made sure both of the car chargers we carry on our site put out 2.4 amps of power to each port. 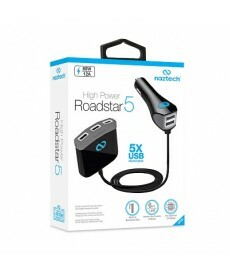 For those of you that have more than two devices to charge at once, the Roadstar 5 ensures that every single connection is putting out 2.4 amps of power. Don't be fooled by other 2, 3, 4, and 5 port chargers being sold. When you look at the fine print you will usually see that one port will provide the 2 amps needed to get a decent charge, while the second, third, fourth, and fifth port are usually only putting out 1 amp of power and sometimes only .5 amps. You can be sure that whichever charger you purchase from us, you will be getting the maximum charging power and speed when you connect any device charged via USB cable. Our dual USB 4.8 amp car charger is able to provide a full 2.4 amps to each port at the same time.Charge times up to 30% faster than standard 1 amp car chargers.Able to charge two Apple Iphones or Ipads simultaneously..